What is the first thing that crosses your mind when you hear the word durian? 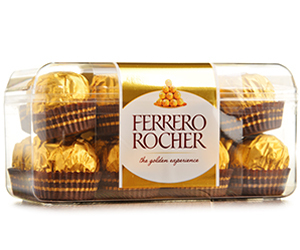 Do you imagine soft, creamy yellow flesh with fragrant aroma? Or is it only a dangerous-looking fruit with a smell resembles wet socks? The exotic fruit really has its own fans and haters. Durian is often dubbed as the smelliest fruit in the world—it is even banned on the Singapore Rapid Mass Transit due to its strong aroma. But other majority of people really loves the fruit. So, what’s the deal with this fruit? Just like Indonesian proverbs tak kenal maka tak sayang (translated as “if you don’t know it, it’s impossible to love it”), it feels unfair to blatantly judge the fruit as the worst fruit ever exists in the world. Let’s explore about this fruit here. The Durian, native to Southeast Asia, has been known to the Western world for about 600 years. The name Durian is derived from the Malay language word for duri or “spike”, a reference to the numerous spikes on its skin. 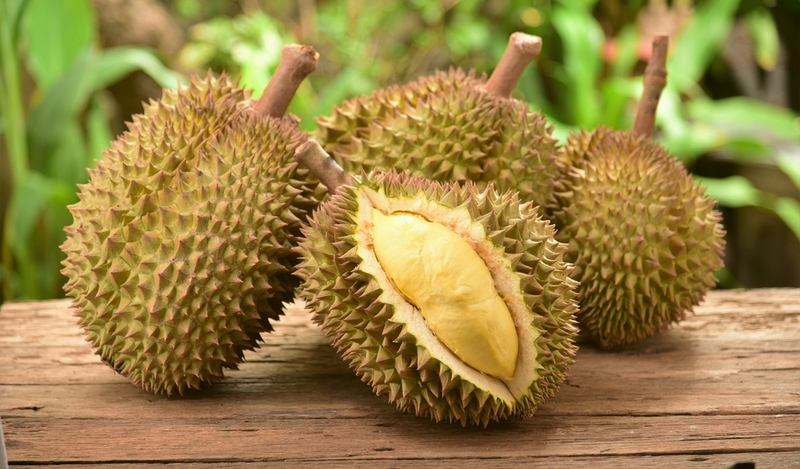 There are around 30 recognized Durian species with at least nine of which produce edible fruit, and over 300 named varieties in Thailand and 100 in Malaysia. Durio zibethinus is the only species available in the international market, also often found in supermarket in the form of frozen fruit, while all other species are sold only in their local regions. Mon Thong Durian is the most commercially sought after for its thick, full-bodied creamy and mild sweet tasting flesh with relatively moderate smell emitted and smaller seed. Many people in the Southeast Asia call Durian as the notorious king of fruits due to its large fruit, strong odor, and formidable thorn-covered husk. 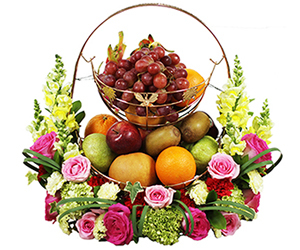 The fruit can grow as large as 30 centimeters long and 15 centimeters in diameter, and it typically weighs one to three kilograms. Its shape ranges from oblong to round, the color of its husk green to brown, and its flesh pale yellow to red (depending on the varieties). 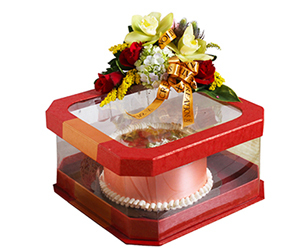 The hard outer skin needs to be pried open with a large knife to reach the soft flesh inside. The smell can be overwhelming for some people, however those who love the sweet and pungent taste of Durian find that the aroma itself can entice their appetite. Durian’s popularity in Indonesia is no joke, and it seems that there are more people who love it than those who hate it. According to a survey from Survei Sosial Ekonomi Nasional (conducted between 2002 and 2013), Indonesia’s percapita durian consumption stood at 1.18 kilogram per year in 2013, while national production was estimated at 750,000 tons in 2014. In Indonesia, Medan in North Sumatera is the best address for Durians. Compared to other regions in Indonesia, Durian in Medan are available all year long. Java also has some Durians, especially the area around Jepara, but prices in major cities of Java are usually around triple the prices of Medan. Es Durian (Durian ice cream), which is a street food in Indonesia. It made of Durian flesh, coconut milk, and sugar. 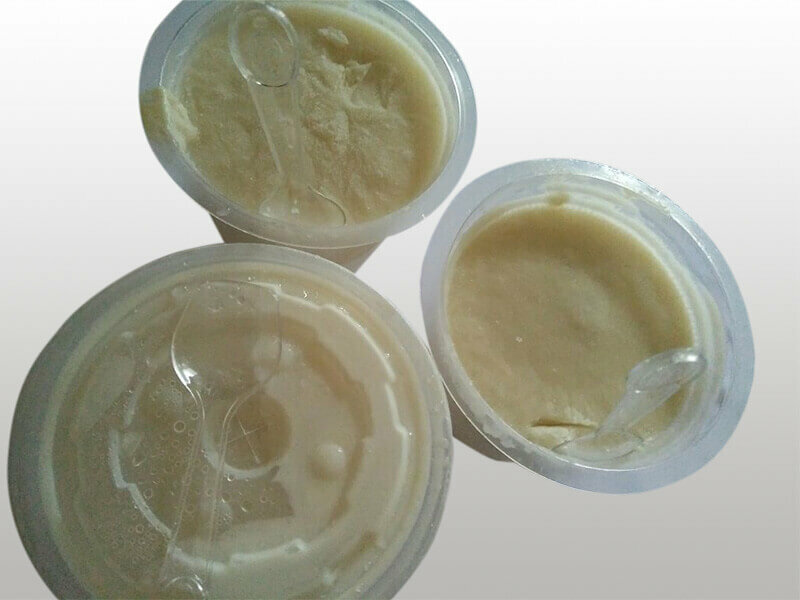 Tempoyak is fermented Durian, usually made from lower quality Durian unsuitable for direct consumption. Tempoyak can be eaten either cooked or uncooked, is normally eaten with rice, and can also be used for making curry. 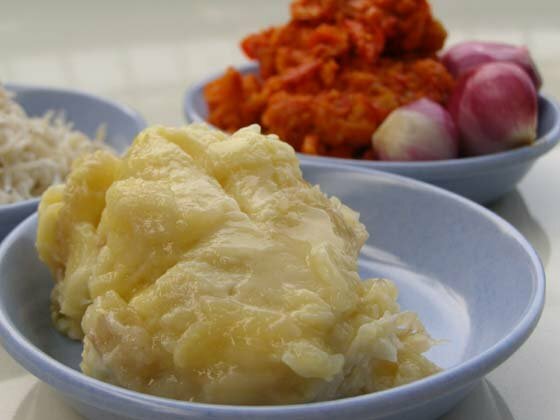 The fermentation process eliminates the strong smell of Durian almost completely. Pancake Durian is popular Medan delicacies. 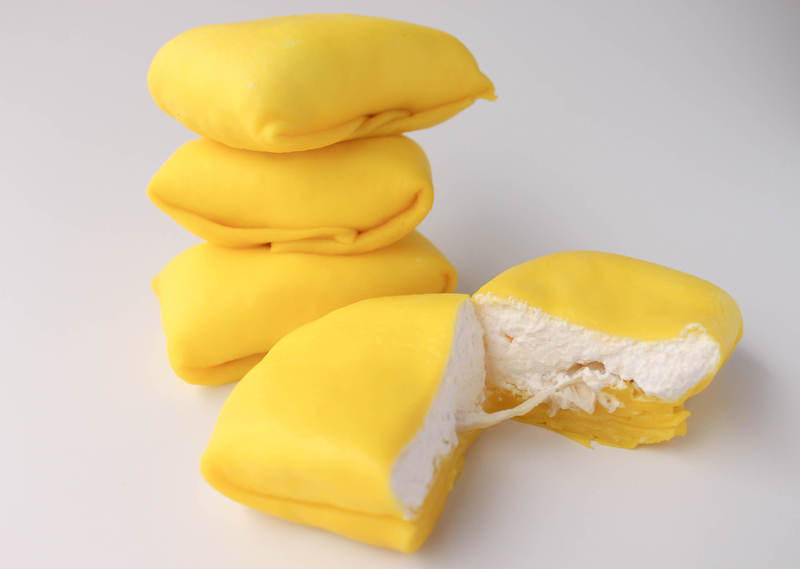 Thin pancake is filled with cream made of Durian flesh is mixed with whipped cream. 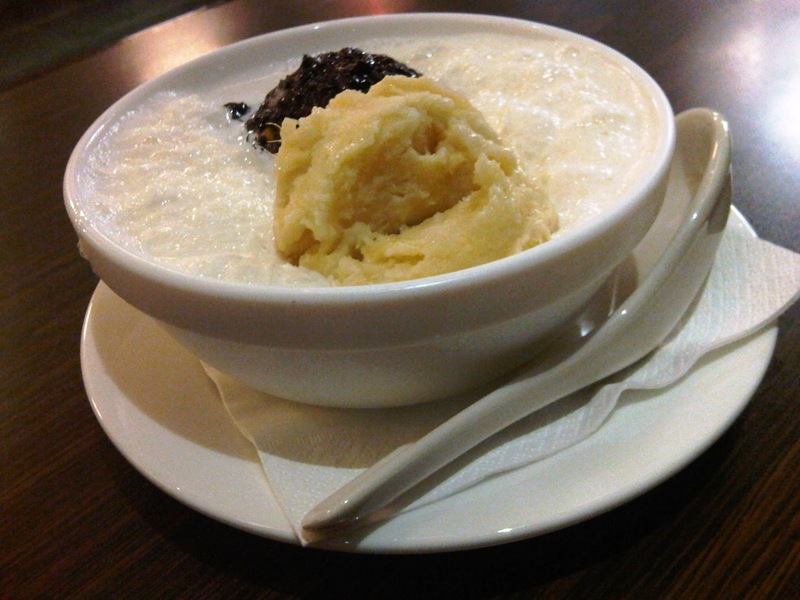 Ketan Durian is glutinous rice steamed with coconut milk and served with ripened Durian. 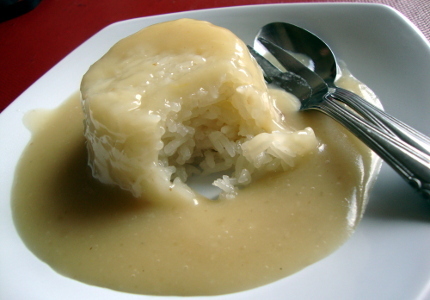 Sop Durian is a modified version of Sop Buah. It consists of shaved ice, red beans, durian flesh, avocado, and sweet condensed milk. 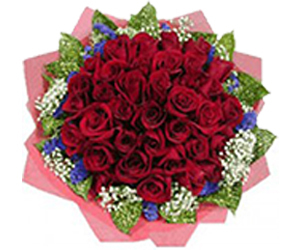 It is a really nice treat for sunny day! If you love Durian or any other processed-version of Durian, there is a few warnings that you need to know. The real danger eating Durians is the fat content. It has about three times more fat than most fruits, with the exception of avocado. For those people battling weight gain and obesity, other sources of healthy fats should be sought out instead. There is also a myth that if you consume lamb or goat meat, and also consume Durian at the same time (say, you have lamb satay and eat Durian pancake afterwards), it will increase your blood pressure and even cause death. You may believe it or not, but the key is always consume Durian in moderation. Too much Durian is thought to be ‘heaty’ and may lead to insomnia.